I know, I know....it is way to early to be making Valentine's Day cards.....Christmas isn't even over yet. But there is a wonderful new challenge up at Caardvarks and our sponsor is Clear & Simple Stamps. They provided us with some fun stamps as well as samples of their new Color Story embellishments. The stamps that I received are the Love Notes and the Color Story is Paint the Town Pink. 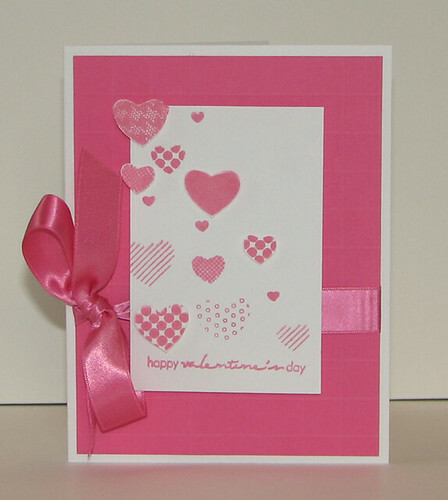 The challenge on the Caardvarks blog is to make a monochromatic card like mine below. Now the sad news is that this will be Caardvarks last challenge. Yes, you read that right. Caardvarks will not be doing any more challenges after this one. *sniff* *sniff* So you better get on over there to check out the other design team members cards and get your monochromatic card linked up by the challenge deadline. There are some wonderful prizes up for grabs. I would like to take a moment to thank the members of the Caardvarks crew (past and present) for all the amazing talent and inspiration that they have shared with us over the last 4 years. I would especially like to thank Jenyfur for giving me the chance to be on such a wonderful dream team of designers. I wish you all the best in wherever your path leads. I will be posting the winner of my birthday blog giveaway in the next day or two. Thank you to everyone for the wonderful birthday wishes!! Beautiful card! I have been making Valentine cards for about a month now for Operation Write Home. I think next year I will make Holiday cards all year long so I don't get burned out before the holiday arrives, LOL! Super cute card! But definitely sad news about Caardvarks! Beautiful card...gotta love the pink! Nope, never too early for any Holiday. As I'm rushing to get my Christmas cards done. Love your card..it's very pretty. Very pretty card. Simply elegant!